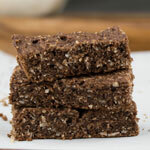 Cocoa powder and lots of coconut make these low sugar chocolate coconut bars a delicious, chewy treat. These are super quick to make, and delicious to have on hand when a chocolate craving hits. Cut these into squares, bars, triangles or any shape that you like. Preheat the oven to 350 F. Grease an 8-inch square baking pan. Line the pan with parchment paper, allowing a 2-inch overhang on the sides. Set aside. In a large bowl, whisk together the flour, cocoa powder, baking powder, salt, desiccated coconut and shredded coconut. In a medium bowl, whisk together the egg, applesauce, vanilla and melted butter. Stir in the flour mixture. Spread the mixture into the base of the prepared pan and bake for about 28 minutes, or until firm. Cool for 15 minutes in the pan, then transfer to a wire rack to cool completely. Cut into squares or bars. For a sweeter bar, replace the 1/2 cup of unsweetened applesauce in the Mildly Sweet recipe above with 1/4 cup sugar. Whisk the sugar in with the egg, vanilla and melted butter in step 3. Omit the unsweetened applesauce. Adapted from: Chewy Chocolate Slice from Bake (Australian Womens Weekly).